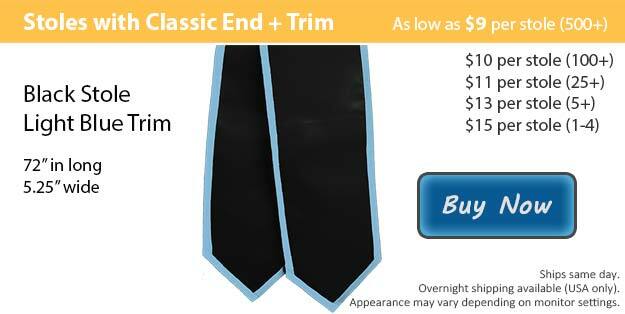 Black stoles with light blue trim and classic ends are an outstanding way to accent the rest of your graduation wardrobe. The light blue is a wonderful contrast against the black, pulling your whole outfit together perfectly. If you are preparing yourself for your graduation then surely you know just how much effort it takes to reach this point and achieve your goal. Here at Honors Graduation we have all of the graduation attire that you may need in order to be ready on time for your ceremony. Graduation is an exciting time, it is a time when your family and close friends all gather to show you that they are proud of you and help you to enjoy this celebration dedicated to your success. When it comes to their wardrobe, it is common for graduating students to follow the tradition that has been in place for many years. Usually dressing in a cap and gown, students also like to wear various accessories to signify special groups as well as their greatest achievements. We know you had to sacrifice a great deal of your time and energy to accomplish all that you have, and now you know that you can do anything you set out to do. At Honors Graduation we use only the finest material to create our graduation stoles, ensuring that they will last you for many years to come. Many graduates hang onto their stoles, often placing them on display in their home to remind themselves of how far they have come. In addition to our graduation stoles with the contrasting trim, our stoles are also available in solid colors. Choose between the two shapes for the bottom of your stole, either the classical shape and the angled shape. Stoles can even be customized with the image and/or wording of your choice, for an additional fee.